The HRM department is a small facilitating department with a focus on recruiting and managing the people who work within the company. This is carried out on a strategic, tactical and operational level. The goal? To ensure the right people are in the right place and to help employees reach their maximum potential in a safe work environment, so that the company achieves the best results. This includes responsibilities in areas such as recruitment, working conditions, answering staff questions, advising management and carrying out a range of administrative tasks. This department is responsible for processing invoices, compiling financial reports and monitoring administrative processes. By processing this information, they help every other department within VB-Airsuspension to grow and improve. Not only do they deal with financial information, but they also get involved with the management of the company and help to guide VB-Airsuspension in the right direction. The department is therefore the 'navigator' of the company! Steffan is responsible for overseeing the finance activities all of the companies within the VB-Airsuspension Group. He also compiles reports for management and coordinates the budget. Did you know that Wilma has been working at VB-Airsuspension for 22 years? 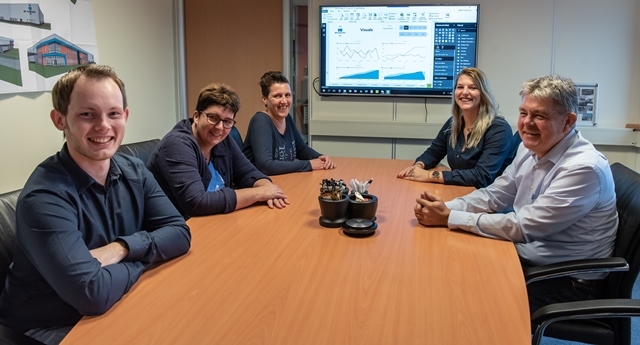 She takes care of the daily accounts of all of the Dutch companies with the VB-Airsuspension Group, as well as maintaining the Humanwave HR and payroll programme, which is used to process payroll. She also compiles the payments every week and handles the VAT declarations. Miranda has a range of responsibilities, including purchasing, accounts payable and accounts receivable administration. She also deals with the declarations for foreign VAT and the CBS (Statistics Netherlands). As a HR advisor, Stephanie is responsible for the staffing and organisational policy. This includes advising management with regard to employee development. She also handles recruitment and selection, leave and sickness absences, performance reviews and assessments, payroll and health and safety, and deals with the Employee Insurance Agency (UWV) and temp agencies. Alongside Wilma and Miranda, Eddy deals with the administration of the Dutch companies within the VB-Airsuspension Group, as well as the German subsidiary. Eddy also deals with sick leave, manages subsidies in conjunction with the Engineering department and handles insurance.